Large-scale oils from one of Cambridge’s rising star portrait painters, Heloise Toop. Just seventeen when she had a portrait selected for exhibition at The Mall Galleries, London, Heloise studied at The Heatherleys School of Fine Art in Chelsea until 2008. 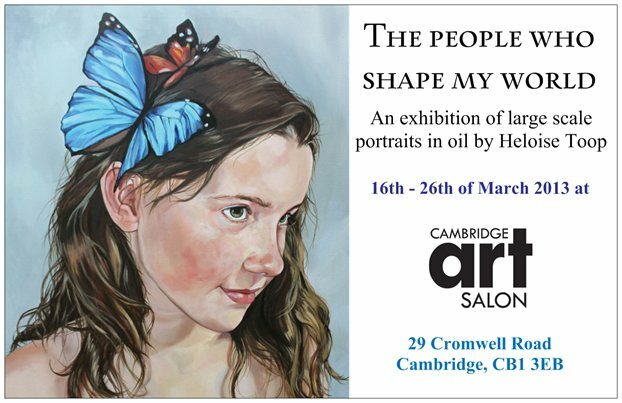 She’s exhibited in various shows around Cambridge and London and undertakes a range of commissions of adults, children and professionals – as well as working on more narrative paintings in her own time. Drawn to bright colours, fancy dress and quirky styles, a unique joie de vivre infuses Heloise’s work that has earned her a loyal following in Cambridge – many of whom are the vibrant subjects of this show.